It’s that time of year again, when the dark days of January are brightened up by the news of the arrival of Marco Buratti’s excellent wine of thirst, L’Ombra. From the Colli Euganei’s vibrant volcanic soils, L’Ombra is bottled by-the-litre young, fun and brimming with energy. Nothing is added, nothing is taken a way. It is a simple, immediate wine that gives life during these short, sleepy days. A drink that makes it impossible not to have a good time. To celebrate the 2015 vintage hitting our shores, we have again invited Marco to London to cook some fried chicken and throw a party in the wine’s honour. The idea is simple, to get everyone out of the house and back together to enjoy some good food and a few glasses of wine. For those that remember last year, we went through hundreds of litres of wine and a whole lot of chicken in a matter of hours. People danced on tabletops. This is one is not to be missed. 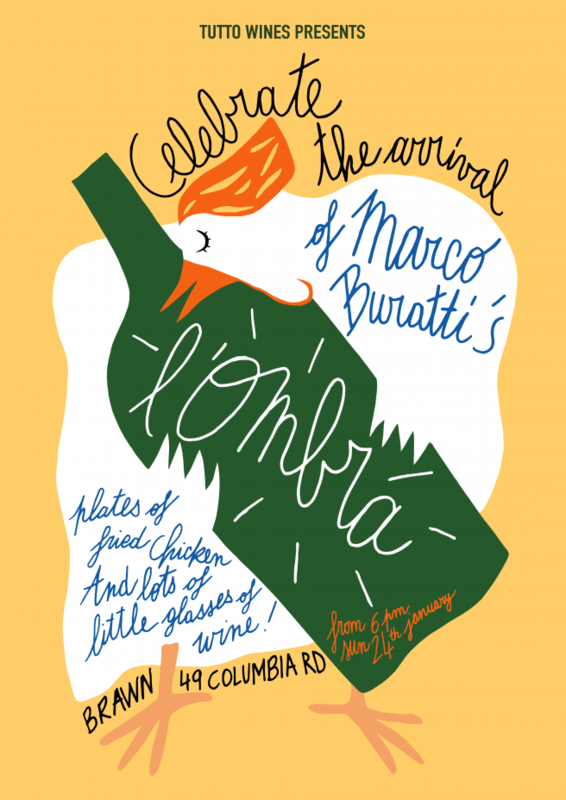 From 6pm until late on Sunday 24th of January at Brawn on Columbia Road join us to enjoy Marco’s new wine by the ombra (a small measure, served in a tumbler, Venetian-style) alongside plates of pollo fritto cooked by Marco and Brawn’s own Ed Wilson in the same way locals have doing for years at Al Sasso, the Colli Euganei’s legendary trattoria that specialises in the dish. There is no need to book, just rug up and get down to Columbia Road for a few glasses and some chicken and let’s have a good time.